The above image is of a suspected connection or alignment of the Temples and stone circles of Malta and Gozo according to the site Malta Discovery. They suggest amongst other things that there was a power or energy grid and that is why they are found/aligned in there places. Were the Temples of Malta actual Temples? The MaltaDiscovery.org site says many "alternative" things but is what it says about the temple alignments true? A good theory predicts so I will try to investigate the temple side of their ideas. Ta´- Qadi (Tal-Qadi) "Temple in Malta. Overlooking the plain of Burmarrad this site is the only known example of a Maltese temple which is not orientated south-east/south since this would have opened on to a steep slope. Why so many on a small island (25 or more? ), if they were for worship why are the chambers so small? Why have the ability to block off each section? Were they used to either capture/convert/store/direct the massive amounts of natural energy that flows through the Earth? Scientists have found huge Telluric Currents that flow through the earth, these massive electrical currents surge the length of continents and across oceans. Perhaps they were known as Ley Lines or they are the smaller versions? Electricity flows between the Sun and the Earth in Flux Transfer Events (FTE's), Solar Tornadoes etc. There is a strange carving in the National Museum of Archaeology, Valletta, Malta - the experts, who admit they can only guess at what anything and everything to do with the Temples of Malta as we have no records or knowledge left by them apart from what we find and interpret, suggest it is a carving of 4 fish. The Temple Builders were amazing architects and sculptures. Look at the amazing buildings they constructed supposedly before the Egyptian Temples. The detail in the carvings is very good. Yet they sem to not be able to carve fish that well. Are these carvings of fish or is it Esoteric (secret) knowledge hidden in pictures? Is this a map or diagram of the diffferent energy patterns that could be created on the island, or the flow of energy that could happen? The front of the block has 3 carvings that progress in complexity. The left hand side of the block does not have a carving on it. The right hand side block has the strangest representation of a fish. Why would you draw a fish like this? It does not even look like a fish. Do the 3 on the front represent the stages of the grid as it was built, that you use to "power up". that can happen or are they to disguise the purpose of these whole block which is the carving on the right hand side, the strange fish - the power grid? This is one of the carvings of animals found on the temples and is also located at the National Museum of Archaeology, Valletta, Malta - right beside the carvings of the fish. Does this also have hidden meaning as it shows the last 2 animals as different to the others? A carving of a fish found at Buggiba Temple. Or could it be something, anything else? Is there a link to where that picture of the grid is from? I know people who are plotting almost the same in Wales. Do you have any images or links to Wales thing? Below is a quote form the website and page this comes from on Malta Discovery (with perhaps the most wonderful logo i have ever seen!). The Temple ring – a series of » Observatories« from humans distant past? Malta, a rocky island situated in the Mediterranean between the tip of Italy and the coast of northern Africa had posed an archaeological enigma since the unearthing, earlier the nineteenth century, of a series of 36 megalithic structures older than any other in Europe and elsewhere in the world. After the Ice age at the beginning of the warm period, in which we are still in today, the water level didn’t increase any further. This lucky circumstance prevented the Maltese main plateau to be totally flooded. However, only the top of the today’s little archipelago Malta remain from a former three mountain patterns. This causes that some of the destroyed huge buildings preserved and did not sink into the sea. But the re-settlers continuously took stone blocks out of the ruins to build houses and protection ramparts for their fields during the year thousands after the flood catastrophe. A t the beginning of the seventeenth century the Maltese Commendatore Fra. Abela has already mentioned this in his II. Book, “The description of Malta, the early names and the first inhabitants” (page 145 to 147). Among others Abela handed down to us exact descriptions of the geographic location of the Hagar Qim temple, and other ruins with their upright stone blocks of immense height. As far as he could research, the buildings were the remains from giant’s activities who have inhabited Malta for an incredible long period of time. Further is to note, He didn’t use the phrase “temple” in his book at all. Despite of the temples ruinous exploitation, and the destructive frenzy, the ground layers remained and therefore the original location and orientation is still recognizable. However, since lasting in ruins for thousands of years this is not evidence enough to realize the truth about the possible function and the real purpose once. If have a look at a map one realize the temple are forming part of a stone circles ring that surround the Islands of Malta all built on carefully chosen dominant places - and as we could recognize - they altogether follow a certain system. However, the many famous researchers and writers have always considered the temples as single units. Yet when you consider all the thirty-six temples as a whole then they reveal their secret. ...As seen on the map there is 11 more temples that have to be excavated or still discovered! A good theory predicts so are there more temples or power nodes in those places? Is the alignment correct, are they on different lines or pattern? Was there a grid or are they just individual buildings? Temple power/energy points and energy flow diagrams? Is there any other possible carvings to show either energy grids, patterns or something of that kind. It is all what you interpret things to be. The same as the Maltese buildings are called Temples. The same as for the Hal Seflieni Hypogeum (The Hypogeum) where one chamber is called by us "The holiest of Holies". Yet it is only half finished. We have no records of what it is. Yet we not just call it this people believe it. So below is a shortened version of an interpretation of not just the Tarxien Temple complex but perhaps all the "Temples" of Malta (full post is on the thunderbolts forum here), Were they used to store and use the earths natural power and did those who used them have "flow diagrams"? This is a map of the Tarxien Temple complex in Malta. Around the site are carvings of spirals. One interesting fact of these spiral patterns is that not one slab of them is the same as any other slab. Do they show the energy flow in those chambers or what could be created. Around the temple are horizontal holes in the thick walls which have been suggested as large doors that could be put up to keep the common people out from the selected special areas. Were these to keep power in or to control the flow of the energy? The flow diagrams could show you what would happen if you shut certain doors, what the natural flow was or what they wanted to get. "An illustration showing the similarities of the Hagar Qim Temple compound layout on Malta when compared to a typical 800 MHz wireless antenna pattern" Variations of this design are found with most of the temples of malta. For the spirals you have in and out parts. 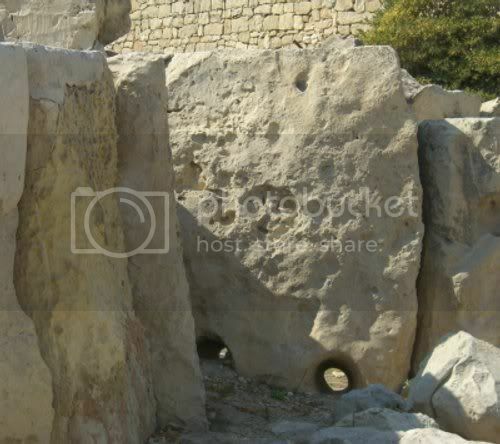 Found around the Tarxien Temple complex are more strange horizontal holes that go through the thick walls and rock. Are these to allow the energy to go out or in? I found rock lines at Pembroke and they are either natural or man made (with Torba?). If they are man made then what is the purpose of them and why do they go in straight lines over the hill top and why that direction? They also appear to be part of a "grid" but most of the main thicker lines go in the same direction. A couple of Pembroke's Rock Lines - "Iwan" and "Douglas"
I thought if they are man made then they could be something like an antenna (after reading the article "Did Ancient Humans Have Knowledge of the Electromagnetic (EM) Spectrum?by Glenn Kreisberg"
The Pembroke Lines are in the exact location where the map has the line going out to Gebel Gol-Bahar and they are along that line. So, could they be man made, do they show a mixture of man made but with signs of the Catastrophe that struck the island (from an Electric Universe point of view). If they are natural then are they there because of the energy grid/lattice - like electrical treeing or to either transform/disperse power? Electric Universe discharge lines? natural Electrical Treeing? - "Reg", "SnakePlissken" and "Poppie"
Are some of them man made (the larger straight ones perhaps?) but the smaller stranger shapes are a natural Electric Universe discharge ( Reg, SnakePlissken and Poppie example) ? SnakePlissken seems to be a discharge line or a connection between the main rock lines above and below it. Are they an antenna or a power boost station, were they to linked or meant to connect the system to Gebel Gol-Bahar, etc...? "Cutter Lines" - near St Peter's Pool going south down the coast you find 2 amazing lines going from the sea into and up the cliff. In gEUlogy terms they look like they have been created or changed by an electrical force (either out of the land or from a "thunderbolt of the gods" lightning strike, likely a pair of them similar to a Birkeland Current?). These lines also fit into where you would expect to find them, the direction needs to be worked out where they are going though. Also at the Naxxar Cart Ruts you have "tanks" like those found in a couple of locations of the map. There a are few more other things that I will add over time that need to be considered. Pembroke Rock Line - "Iwan"
Pembroke Rock Line - "Douglas"
There are a number of lines found at Pembroke,they appear to be running in the same direction and there are some smaller cross lines that are almost parallel, like a grid. , Iwan is perhaps the longest straightest one so is a good rock line to investigate the alignment of these lines/grid. The others will be investigated again to see their alignment. Lines just over the top and "west" side of the hill at Pembroke, next to each other as you go down. These are the thicker lines that also form "ridges". There are other lines on the hill. These also seem to be connected through perpendicular smaller feeder lines showing signs of gEUlogy. Grid Rock! Power extension lines and grid patterns/blocks on the Lattice? How I found these rock lines is that Pembroke Hill is a "rolling hill" type that you get in other countries but should not really get on a limestone island. The curving hills or undulations go down to St Geoges Bay. If the earth is formed or shaped in an Electric Universe then forces create these shapes so gEUlogy "things" should be found in those areas. There is lots of strange features in this area if you look with Electric EYEs. Why rolling hills? Either to do with frequencies or cymantics. Perhaps the reason why you get rolling hills as the foothills of mountains, why streams can be found near rolling hills but perhaps the strangest thing is the normally perfect shape of rolling hills. How can erosion wear away so many different landscapes with all their different materials, forces, weather conditions, time and yet they are so rounded and rolling? The lines on the top and side of Pembroke Hill have been investigated a lot but I was saving the front (North) of the hill and down to the sea for a specific time. After seeing the map on MaltaDiscovery it was time to see if my and their ideas might have some relevance in this unexplored area. I followed on past the North end of Iwan and found that the line continued up until the collapsed concrete structure. Carrying on and starting to go down the slope there is another thick line that seems to be aligned in the same direction. At the bottom of it you can see a c and also at the bottom there are some perpendicular lines that form grids or boxes. Around this area of the bottom of the hill and to the sides are more grids or boxes. There is also some more thick rock lines. If they are man made what and why are they? Why create parallel lines going up or down a hill, especially when the terrain is rough? The Fertility/Death Cult and Temples/Circles ? What are we told compared to what we actually know or can observe? Everything the experts tell us about the use of the Temples or the people who built them is a theory. The only things we know is what we find. We have no knowledge of these people. The fact that we call them Temples is our own projection onto these people. Remember how knowledge of the past people and cultures always changes? Does what we can see or found match up to the experts view? If you ever read or visit the Hal Saflieni Hypogeum you will always be told about "The Holiest of Holies" room. If it was so Holy why is it not finished? Why is it only half a room? Have a look for yourself. What do you see not what are you told you see? Malta's Temples and Skara Brae - built as energy buildings - to cook food? A theory that the Temples/buildings were for energy not worship? The "Temples" of Malta suffered from fire, the same as other ancient Temples, forts and buildings around the world. How and why did they all suffer the same fate. What energy source was great enough to melt rock to create vitrified forts? could they have been designed and built to harness/store the natural energy that flows through the universe and the earth? The stone Temples of Malta and the stone houses/buildings of Skara Brae Orkney Isles should have nothing in common. Supposedly built millenia apart (the Megalithic Temples of Malta were built BEFORE the Egyptian Pyramids we are told) and literally worlds apart for those times there should be no common links. 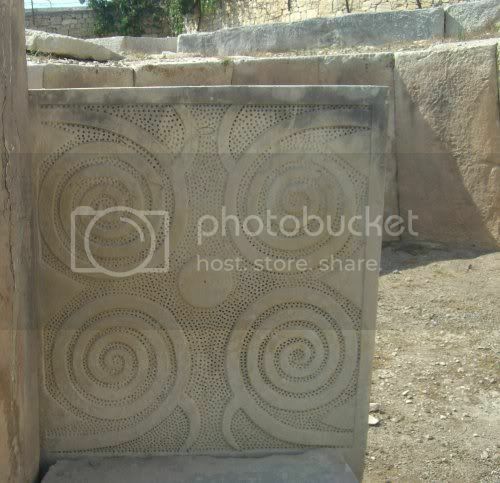 We are told that the Temples of Malta had "libation holes" used to collect food/drink waste, they certainly had stone shelves and either fireplaces or massive Torba stone pots in central places in the rooms. They were abandoned and the culture dissapeared. The stone buildings of Skara Brae were found with a layer of food gunge, these were meant to be houses. They had similar stone shelves, a fire place in the middle. they were also abandoned and the culture dissapeared. The floors of most of the houses were covered with a rather disgusting gunge when they were excavated. This had been replaced by gravel. ...This house is different in layout to the rest of the village and seems to have been used a some sort of workshop. Inside this house were a great number of heat treated rocks and a layer of well rotted organic material. How did the inhabitants of the houses of Skara Brae in the Orkney isles heat up the stones and cook their food? Here are some of the many heat crazed rocks found scattered around the floor of this building. These had been subjected to severe thermal shock but heating to red heat and then suddenly cooling. possibly by dropping into a tank of water. Doing this would have would have heated the water in the tank. Were these buildings used to concentrate the energy to heat the rocks, germinate seeds, cook their food? Middens, organic material or Orgone Accumulator? Archaeologists call it 'midden material' and it is all the junk of the inhabitants for hundred of years, thrown outside to rot. Once rotted it greatly enhanced the insulation and longevity of the buildings but how it must have stunk in high summer, when it was first deposited. Archeologist Euan Mackie noticed that there are far more carcass bones than there are skulls to match them. The shortage of animal skulls shows that the people here imported pre-butchered carcasses. So the question still remains how did they cook their food, enough to totally burn the rocks and food? Why would you live in a place with no natural resources to heat and cook? Especially in the Orkeny Isles? Perhaps they stayed and lived there because they did have a natural resource and source of power. The Electric Universe. The ancient cultures seemed to have access to knowledge of natural power and it is also likely that our Solar System and the Earth were more electrical in those days. The something happened, a great catastrophe occured. All around the world places were abandoned, cultures dissapeared and buildings were vitrified. How could this have happened all over the world at the same time? Did the natural energy stop flowing or a massive catastrophe struck the earth? Did this cause back EMF or counter EMF and this sparked off the vitrifiaction? Is everything we are told by experts about the ancient cultures wrong? When the Romans arrived the ancient inhabitants of Britain were barbarians who painted their naked bodies blue, but the city of Rome was two and a half thousand years in the future when Skara Brae had been built complete with its underground sewage disposal system. Tarxien also has a chapel with drawings of goats, sheep and pigs. Below the main altar, a flint knife and a mass of horns and bones have been found, suggesting the animals might have been sacrificed as part of the temple rituals. Many of the niches were crammed with horns, skulls and half-burnt bones of oxen, sheep, goats and pigs. were the bones not burnt away from these niches but perhaps half burnt very close by or even in the niches? Were the hypogeum in Malta used to cremate the dead, use the natural energy of an electric universe? Other power grid shapes or destroyed temples so we wont find a pattern? Nassim Haramein is very close in this clip, if He had gone the whole hog and positioned the spirals on fibonacci sequencing spacings then the interferance pattern would have developed a really clear dominant cross. The reality is that overlapping such interferance patterns sited at fibonacci measure distances apart spiral in opposite directions. This gives two parallel interferance patters where bloch walls and neel walls occur along them. The interferance patterns created are to scale and cover huge distances. It may be easier on an island such as Malta to identify such circles as shown here in the cotswolds? quote from the board " Is everything a frequency, is it a harmonic/musical Universe?" With the possible energy lattice/grid on Malta there could be missing Temples or stone circles and there is also the possibility that other Temples were destroyed if Malta suffered from a catastrophe that detroyed and removed land. So maybe the option is to find a pattern with what the temples/circles we have left and then to see if other patterns/grids would fit into these on a micro or macro scale.